I’m not sure why, but I was lying in bed this morning thinking of pay phones. It would be nice to think that the memory was the last remnants of a particularly wonderful dream, not just some random thought that spun itself into my brain. You don’t see pay phones much anymore, and to tell the truth I can’t remember the last time I saw one on the street. I suspect that the odd bar and most federal buildings will have them tucked away in some unobtrusive corner for the odd, antiquated person who shuns modern technology. Now that I am thinking about it, there were pay phones in the hotel lobbies down in Las Vegas. I guess anything that takes coins is fair game in Vegas. I kind of miss the pay phones; just seeing them gave me a feeling of being in touch no matter where I found myself in the world. I can remember that pay phones were on almost every corner when I was a kid. The ones that I remember all had coins slots for 5¢, 10¢ and 25¢. For most of my life a call cost 10¢, but changed to 25¢ when I was a teenager. You could always get the operator for free and in a pinch you could make a collect call for someone to come and rescue you. Normally, you would always have a dime or a quarter in your pocket in case of an emergency. Sometimes you would have to make a decision whether you needed a candy bar more than you needed that feeling of security access to a pay phone. In my experience, munchies would trump safety every time. I went out with a girl who had a necklace that held a quarter inside of it. I suspect that her dad bought her the necklace when I started to date her. It was kind of pretty and useful at the same time. She spent the money once and somehow her dad found out and she was grounded for a week. 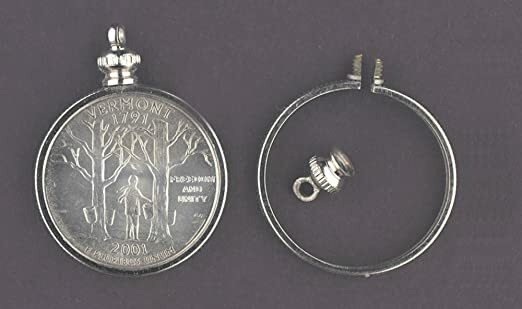 I carried a keychain that held a quarter for a number of years and just never used it. By that time in my life, I always had some coins in my pocket and never had to use me “emergency” quarter. Phone booths weren’t just for making phone calls. Each and every phone booth had two phone books, a white pages and a yellow page directory which were handy if you got “sort of” lost and actually needed the correct address of someplace. The pages were also good if you needed to make a note or write down that cute girls name and phone number. The booths provided temporary shelter from the rain and wind. I would often duck into a phone booth when the wind was howling to light a cigarette with relative ease. In later years the phone company built phone booths without doors for some reason and an opening at the top and bottom which the wind blew through with ease. Shortly after that, the phone booths lost their “booth” part and became phones with two short sides attached. Probably they figured out how to waterproof the phones by then. Phone booths began to wane with the proliferation of cell phones. The ones that were left fell into disrepair and more often than not would be missing the phone books or have the handset missing or damaged. I suppose that they ceased to make a profit for the phone company and just became a liability over time. 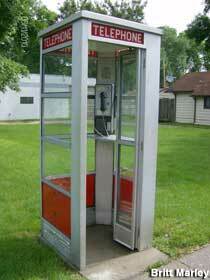 I kind of miss phone booths, but I have a cell phone myself and can’t imagine a time that I would use one now. Even if I were without my cell phone, someone I was with or even a perfect stranger would loan me theirs for a quick call. Times do change, and I suppose we change with them.